Articles and papers may be submitted either for our seasonal publication or for our continuously published online publication. 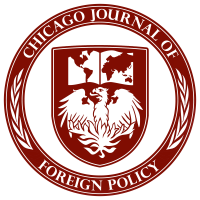 All submissions should be emailed to chicagojournalfp@gmail.com. Content pertaining to the period from 1950 to the present is preferred. Content that reflects on historical, economic, political, cultural, etc. developments within nations other than the United States, or explores relationships between the United States and other nation(s) and our foreign policy concerns, or analyzes developments in international organizations and structures, is preferred. If appropriate, one or more legally usable images, maps, or figures should be attached to all submissions. Legally usable media would include those in the public domain, available under a Creative Commons license, or includable as fair use. Print journal submissions should run at an approximate maximum of 4,000 words (not including bibliography), though this limit is flexible. Word Documents (.doc/.docx) are strongly preferred. Content should pertain to events of the past 5-10 years, and should follow the same content guidelines as listed above for print submissions (i.e. should pertain to comparative politics or international affairs, broadly construed). Blog articles should err on the shorter side of the below word count range, and should pertain to events of the last 1-2 weeks. All citations should be provided in the Chicago style, with running footnotes and a separate bibliography listing all pieces cited. Shorter online submissions (e.g. blog posts) should run between 500-1500 words (not including bibliography), and word count/format for online pieces should reflect the guidelines listed for print pieces above. Longer online submissions should not exceed the limit for the biannual journal.